1. We encourage you to share this test with your spouse. But, if you are currently having tensions in your marriage, don’t take this test together or discuss your conclusions except in the presence of a wise Christian pastor or marriage counselor. 2. As you reply, concentrate on yourself, not on your spouse. 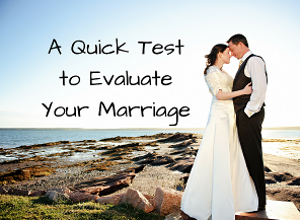 CONTINUE READING: A Quick Test To Evaluate Your Marriage.